(KGTV) - Spring is here in San Diego, and that means another season of Padres baseball! The Padres open the 2018 MLB season on Thursday, March 29, against the Milwaukee Brewers. The game is the first in a three-game series at Petco Park, with the team not scheduled to play on Easter Sunday (April 1). Some of the events prior to the Opening Day matchup include the U.S. Navy “Leap Frogs” Parachute Team presentation; the unfurling of the Holiday Bowl Big Flag, which will be held by Navy Region Southwest sailors; and the ringing of the Ceremonial Bell by Marine Corps Capt. James Henning. San Diegan Jackie Foster, a 2018 contestant on NBC’s “The Voice,” will perform the National Anthem. After “The Star Spangled Banner,” four F-18 Superhornet jets from the 3rd Marine Aircraft Wing will perform a flyover. Navy Petty Officer First Class Yarrick Sharod Conner is scheduled to perform “God Bless America” before the 7th inning stretch. Trevor Hoffman, the former Padres closer who was recently inducted into the Baseball Hall of Fame, is set to throw out the Ceremonial First Pitch. This year’s Opening Day starter for the Padres is veteran lefty Clayton Richard. First pitch is scheduled for 1:10 p.m., and all fans at the game will receive a special Opening Day hat. As a sellout crowd is expected for the home opener, team officials are urging attending fans to arrive at Petco Park early (suggested time of no later than 12:30 p.m.) and purchase parking ahead of time. All stadium gates will open at 10:30 a.m., which will allow fans to watch the Padres’ batting practice. The visiting team’s batting practice begins at about 11:35 a.m. Anyone interested in pre-purchasing a parking pass can do so at the San Diego Convention Center or Hilton San Diego Bayfront. Fans can also click here for more parking pass buying options . Guests without pre-purchased parking passes are encouraged to utilize public transportation or Uber, the preferred ride share partner of the Padres. Uber is providing fans a free first ride (up to $15) by using code: PETCOPARK. The MTS is increasing trolley service to help fans get to and from Petco Park for Opening Day. The trolley’s Blue Line, which runs between downtown San Diego and the South Bay, will increase service starting at 11:45 a.m. to every 7 1/2 minutes before and after the game. The Orange Line will have trolleys running every 15 minutes throughout the day. Green Line service to and from Mission Valley will increase to every 7 1/2 minutes before the game, with extra trains running after the game as needed. 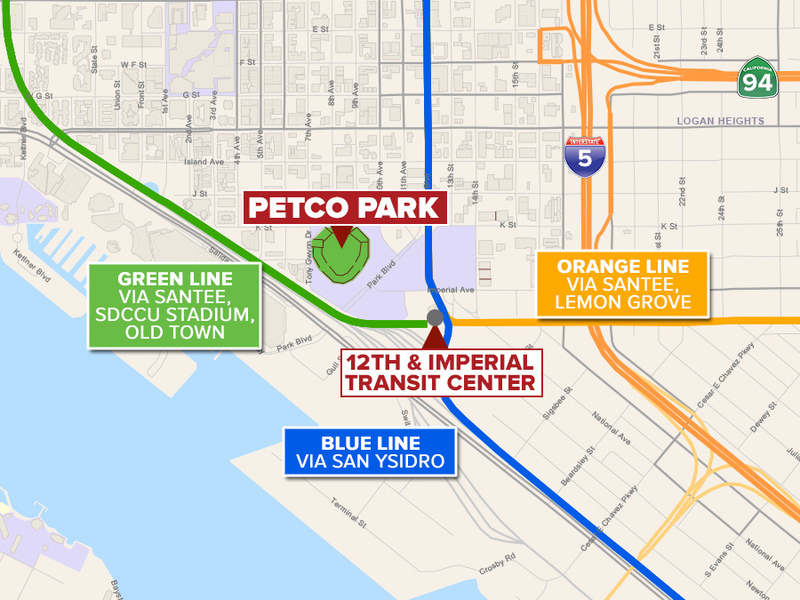 Fans parking at SDCCU Stadium, which will have 5,000 free parking spots available, can take the Green Line directly to Petco Park. Passes good for the entire day can be purchased for $5, and MTS urged riders to use its Compass Cloud mobile-ticketing smart phone app to avoid ticket lines and purchase several tickets at one time. The North County Transit District (NCTD) will offer extra Coaster service with trains departing from Oceanside Station at 9:37 a.m. and 11:08 a.m. Free parking is available at all North County Coaster stations and RegionPlus Day fares include free trolley connections. After the game, a northbound Coaster train will leave Santa Fe Depot 60 minutes after the last out. The Amtrak Pacific Surfliner also offers service to Santa Fe Depot and is a proud partner of the Padres in 2018. For more information and updates, visit the Petco Park transportation page here .